The Death Star Repairmen are a small group of dedicated servicemen who, after a lengthy tour of the Imperium's greatest space station repairing the controls that extend the bridge, finding out what shut down all the garbage mashers on the detention level, and filling in all the blast points in the corridors, like to relax with a few drinks and some good music. ONGOING: SCI-FI SCIENCE: PHYSICS OF THE IMPOSSIBLE Dr. Michio Kaku explores various fantastic sci-fi concepts and how to make them real with what we know today. The Death Star Repairman gets frequent sound bites and an occasional song in over the course of the series. Follow the link for the broadcast schedule. ONGOING: JEDI JUNKIES This affectionate look at the people that make up Star Wars fandokm includes a song and several insightful comments from the Death Star Repairman. 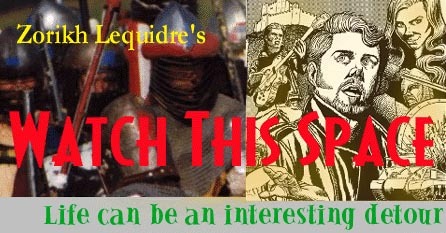 Follow the link to the website to buy or rent it from iTunes or Amazon.com. April 15-17, 2011 Performances at I-Con Convention at SUNY Stony Brook. 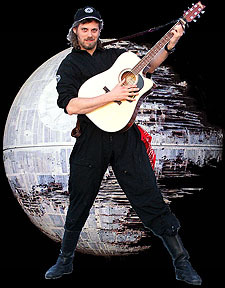 The Death Star Repairman will be singing songs from his new CD "Cosmic Dust Bowl" as well as some of his favorites, at performances at 10 :00 PM on Firday and Noon on Sunday, as well as joining some filk circles, where anything can happen! Here is a video of one of these performances! March 27, 2010, 3:00 PM: Star Wars Variety Special at I-Con Convention at SUNY Stony Brook. The Death Star Repairman will be performing several hits from the album "Another Night in Mos Eisley" and teaming up with the Emperor and other special guests for a rousing rendition of "Red Five!". You can see video from previous I-Con performances on YouTube! Video from this performance can be seen at BillyAxe's youtube Channel! May 27, 2008: Rebel Rebel's Star Was Burlesque at Lit Lounge! playing "Stormtrooper Blues" for the Stormtrooper striptease number! May 18, 2008: The Gong Show at Arlene's Grocery! April 4-6, 2008 I-Con Convention at SUNY Stony Brook. The Death Star Repairman will be performing at the Cabaret at 8:00 PM on Saturday, and a full set Sunday at 3:00 PM. You can see video from that performance on YouTube! June 7-8, 2008: The Big Apple Convention The Penn Plaza Pavilion, 7th Ave & 33rd St, Manhattan. Saturday and Sunday, 2/24 - 2/25/07 NEW YORK COMIC CONVENTION The Javits Center. The Death Star Repairman will be playing some music during the NY Jedi performances. 9/6/06: Captain Zorikh's Birthday Gig! 7:30 PM, Stain, 766 Grand St, Williamsburg, Brooklyn. L Train to Grand St, walk east one block. 3/12/06: Live at 169! 8 PM, 169 Bar, 169 East Broadway, between Rutgers & Jefferson St's. Take F train to East B'way, get out Rutgers St exit. 1/14/05: The Big Apple Con The Penn Plaza Pavilion, 7th Ave & 33rd St.
1/13/05: Live at 169! 8 PM, 169 Bar, 169 East Broadway, between Rutgers & Jefferson St's. Take F train to East B'way, get out Rutgers St exit. 9/6/05: Captain Zorikh's Birthday Gig! 169 Bar, 169 East Broadway, between Rutgers and Jefferson Streets, NYC. Star Wars Opening Day Party at Plan B! That's at the bar/night club Plan B at 339 E. 10th St. For more details go to The Angel 503z Party Page . Note: None of these links are "sponsored." I just put them up there because I though they were "cool." You can order the latest Star WArs DVD's, Toys, Computer Games (Playstation 2, XBox, etc. ), Music CD's, and VHS tapes, through Amazon.com, below. A percentage of your purchase will go to support the Death Star Repairmen band.